Among other things, Gene is a woodworker. We had run into each other at the coffee booth at the farmer’s market a couple of times and had got to talking about my blog. That led to a conversation about fungus, during which he asked me if I knew about “spalted wood”, a fungus-infected wood much prized among woodworkers. I hadn’t, so he had brought me a piece. I examined the block. 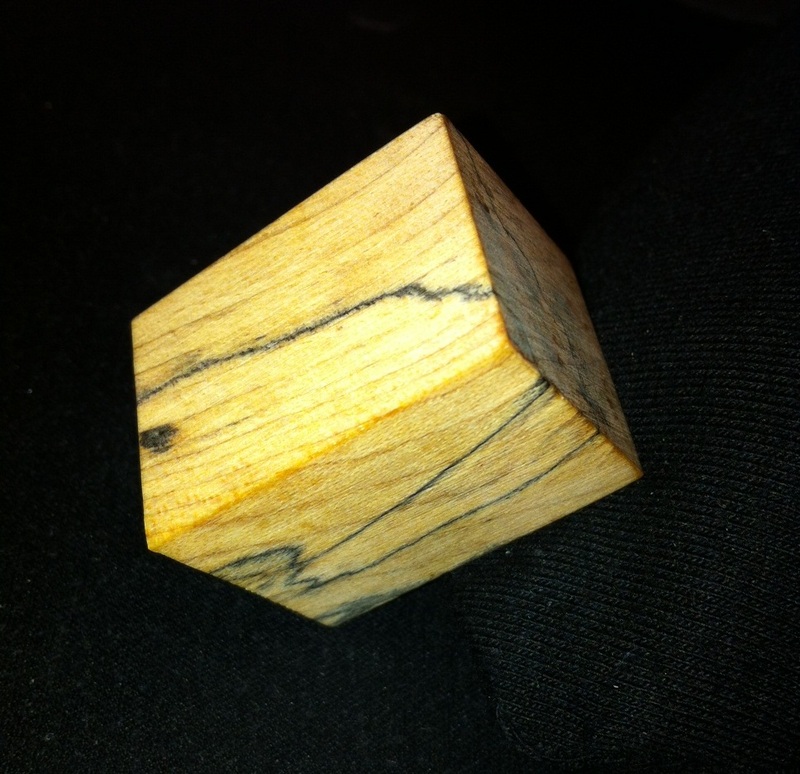 It was cut into a cube and sanded smooth on all sides – the leftover end cut from a pen blank Gene told me. The color was creamy beige, the way you’d expect maple to look, but on its surface it appeared as though someone had taken a fine-point black pen and had hand-drawn tiny wiggly intersecting trails all over the block. “Yes, right here,” I told him, pointing to the lines. Gene went on to explain that the fungus itself – the main portion of it – would have been located within the spaces when it was alive. The lines —called zone lines – merely showed where one fungus had encountered another. Yes, the lines were technically part of the fungus, but in effect were really just boundaries demarcating each fungus’s territory. In essence, these were the lines in the sand between warring fungi. No fungus illustrates this warfare better than Armillaria, a genus of parasitic fungi that thrives on living, weak or dead wood. 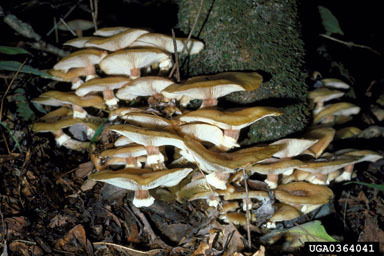 Armillaria is commonly known as Honey Fungus for its honey-colored mushrooms that form around the base of dead or dying trees. 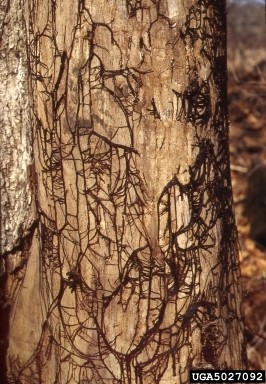 Many species of Armillaria are destructive root-rot pathogens, invading and killing a wide range of host trees including forest and cultivated hardwoods, conifers, orchard trees, and other woody plants like coffee trees and rhododendrons. Armillaria’s invasion begins in an old log or, commonly, in a cut tree stump. Once firmly established it takes on a military-like operation to expand its range. With the stump acting as home-base and supply depot, the fungus creeps its way along the stump’s roots and expands to nearby trees by way of root-to-root contact. As long as the roots of other trees are touching or in close proximity, the Armillaria hyphae (microscopic thread-like filamentous growths) can continue to spread. As it spreads, the hyphae forms masses called mycelium – a web-like collection of filament. At the same time other Armillaria hyphae are mounting a cross-country expedition, hunting a new host across treacherous open ground. The hyphae expand in every direction, growing through the soil and under the leaf litter. The distance the mycelium can spread is limited, however, because, until it reaches a new food source, it must rely on the home stump. And it’s dangerous crossing open ground. The hyphae stand a high chance of being damaged by animals, fire, or even too much direct sunlight. A damaged section could leave patches of mycelium cut off from the supply chain. So for the cross-country trek, the fungus steps up its defenses. More filaments are laid down and from these rhizomorphs are formed. Also known as mycelial cords, rhizomorphs are strong root-like structures formed of bundles of parallel-running hyphae protected by a hard outer shell of melanin. Rhizomorphs are remarkable in that they function as a unit, much like a single root or vine with a growing stem-tip. They are strong enough to invade healthy wood and can grow quickly — up to 19 mm per day in some species – even without having access to a new host. Like vines and roots, they branch regularly, but unlike their plant-counterparts, rhizomorphs branches may rejoin each other or join different branches through a process called anastomosis. This gives the entire network strength that is greater than the sum of its parts. If a rhizomorph is severed, it may still be connected to the rest of the colony by way of other attachments. These features make Armillaria extremely robust. Unchecked, a single colony of Armillaria can cover acres of land and live for centuries. In fact, one specimen of Armillaria solidipes in Oregon is considered to be the largest living thing in the world, estimated to cover over 2,200 acres (890 hectares) and be at least 2,400 years old. Over that time, this colony has killed tens of thousands of trees in the Malheur National Forest [pdf] and surrounding areas. And there is no way to stop it. Once the rhizome reaches a new host, it sends word back to the home base via chemical signals. The home colony responds by committing all of its energy and resources to that section and the rhizomes begin to infiltrate the wood. The mycelia are responsible for drawing water and carbohydrates from the tree to feed the fungus. To do this the hyphae first break down the wood by secreting enzymes into it. Once the nutrients are broken into simpler forms, they are absorbed by the mycelia. The process usually begins below ground, travelling upward along the roots. In trees, fan-shaped mycelial mats spread beneath the bark and up the tree, sometimes to a height of several feet. The fungus spreads through the wood claiming more and more ground. This is the place where the battle lines are drawn. Where no other fungus is present, Armillaria spreads unfettered. However, if it encounters another fungus it creates dark tangled walls of mycelia –zone lines — to protect itself and its resources. Because the fungus is within the wood, not just on the surface, zone lines enclose 3-dimensional spaces. Interestingly, it used to be thought that fungus populations of the same species worked together (the “unit mycelium”) within the same wood, fusing, cooperating and sharing their nuclei. But, through DNA testing, mycologists at Exeter University determined that Basidiomycetes fungi (which include Armillaria) recognize different genetic lines of their own species as an enemy. This intraspecific antagonism means that every colony of Armillaria retains its own unique genetic identity. It was by testing for this unique genetic identity, that mycologists learned that the Armillaria solidipes infecting Malheur National Forest was a single colony. The intraspecific antagonism also means that when two genetically distinct colonies of Armillaria meet, they both erect their own zone-lines, creating a thick double wall. And this brings us back to spalted wood. Spalting is defined as any coloring on wood that is caused by a fungus infection. Besides zone-line formation, there are two other kinds of spalting — pigmentation and bleaching. Pigmentation is the addition of color to the wood. Bleaching is just that, a whitening of the wood. Armillaria causes both bleaching and zone lines, which makes it nice for creating spalted specimens. Working with spalted wood was all but unknown until the 1970’s. In fact, fungus-infected wood was studiously avoided until then. It’s tricky stuff to work with since the fungus is actively rotting the wood, and multiple fungi can rot a single piece of wood at different rates. 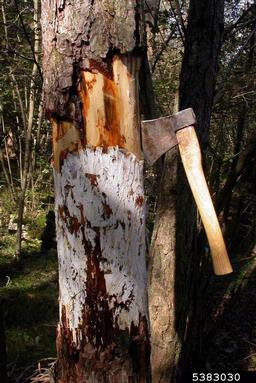 This can create weak areas in the wood. As such, spalted wood was considered inferior. However, in the 1950’s, a woodturner in the Adirondacks of New York was experimenting with spalted wood. Melvin Lindquist, today a foundational legend in the woodturning community, is credited with inventing several new machines and developing pioneering techniques for turning wood. He was also bold enough to confront the problems of spalted wood head on, and the pieces he was turning out were stunning. Today woodworkers have fully embraced spalted wood. The colors and lines add richness to otherwise straightforward wood grain. Spalting now appears everywhere that worked wood is found: sculptures, food vessels, gun-stocks, furniture, jewelry, knife-handles, lamp bases, picture frames, writing implements, and even musical instruments. In the old days, woodworkers scoured the forests, picking up downed logs and cutting them open, hoping to find a beautifully spalted piece of wood. Sometimes they would leave pieces of wood outdoors, in hopes of it picking up a spalt-inducing fungal infection. But this was chancy work. Lots of logs had to be cut open before a suitable specimen would be found. Mostly they just found rot. Nowadays woodworkers try to induce and control spalting on their own. To develop usable spalted wood requires a delicate balance. Too much fungus working too fast, and the wood decays, leaving it useless. Too little fungus or the wrong pairing of wood and fungus, and spalting doesn’t occur. Too slow and nobody wants to wait for it. Not only that, but many spalting fungi (like Armillaria) require a fungus to go before them in order to spalt. It’s a tricky balance. So the goal of intentional spalting is to find ways to induce spalting quickly, reliably and with predictable results without undue damage to the wood. Probably nobody is more the expert on doing that than Dr. Sara C. Robinson, Research Assistant Professor at Michigan Technological University. Also a talented woodworker, Dr. Robinson (to use her words) blurs the line between art and science. Armed with a PhD in Forest Science and an eye for beauty and artistry, she has made it her quest to turn spalting from an accidental find into a predictable science. Through her work at Michigan Tech and at her lab at the University of Toronto where she is also an Assistant Professor, Robinson has published a raft of papers on the science behind spalted wood – how to stimulate spalting, ways to create specific colors, and wood preferences of various species of fungus, among other things. makes it a point to do just that. Not only does she apply what she learns to her own beautiful pieces, but she freely and passionately shares the results of her research with woodworkers and artists. She has blogged on spalting for Fine Woodworking under the pseudonym “Dr. Spalting,” where she amicably provides woodworkers with the results of her latest research – such things as lessons on various fungus species and her take on alleged spalt-enhancing tricks of the trade (urine?). As well, Robinson is an entertaining speaker and workshop presenter. In fact, it was Gene, the woodworker from the farmer’s market, who gave me her name after attending one of her workshops. So, true to their invasive nature, decay fungi have extended their reach. Once confined to forests and old wood piles, they have crept their way into the laboratory where they are nurtured like favored pets. In petri dishes and test boxes they are offered the food and substrate they like best, given the right mix of light and water, and are rewarded for good spalting performance. At the same time, in a stretch that seems to defy our natural aversion to decay, the fungi and the marks they leave have made their way into fine art. In the hands of artists, those swashes of color and delicate trails are no longer portents of imminent decay, but instead are pearls to be sought in an oyster of wood – some found by lucky accident, others cultured by design. I admit, I’m now a fan of spalted wood. In fact, as I was finishing up this post, I decide to take a look at all my wood products at home to see if I had accidentally bought any spalted pieces over the years. I checked all my furniture, wooden bowls, sculptures, and knife-handles. Alas, aside from the little sample Gene gave me, my house is spalt-free. This is a deficit I plan to remedy. I’ll let you know when I find the right piece. NextGot the best job in the world? Shout it out! And I thought I knew what spalted was. Thanks, from a sometime woodworker. Thank you Zavorka. I read your blog (badly translated by Google). Nice of you to include my post. Is there any chance that this practice could end up letting loose new species of fungi into new sites and cause problems? If only my life was that interesting. I don’t think any of my students even know how to cackle, although I think one of them is quite good at Halo. The less than exciting truth is, all wood has fungus on it. Any time you move wood or buy wood, finished or not, it has fungus on it or in it. Everything has fungus on it, because fungi are always in the air. So if you’re not concerned about that Rubberwood cutting board you bought at Wal-Mart last week and the potential tropical fungi living in it, why would you be worried about spalted bowls made with native fungi? 1) We’re not ‘creating’ or ‘mutating’ fungi. Just like any other culture collection, we keep the fungi in storage, then grow them on wood when we want to use them. No gene splicing, no genetic anything. Just mushrooms on malt agar stuck in a drawer. 2) We only use unrestricted fungi for spalting. That means the USDA does not have use or transport restrictions on these fungi. They are not plant or human pathogens. I can ship them through the US postal service. 3) Most of these fungi are ubiquitous in nature. They occur all over the US, and many occur all over the world. 4) How are the fungi even going to get out into the environment from a finished wood product? That’s even assuming that they would somehow still be alive, which is highly unlikely. So, in response to the question – no. There is no chance. Thanks for your question Niki. Are there any related human health issues to be concerned with (other than the dust itself) from working, sanding etc? Not any more than from any other source. As Dr. Spalting points out above, fungi are everywhere. Sweeping your garage, splitting firewood, or working the garden expose you to fungi. In fact, any wood you work and sand has fungus in it. It’s only under certain circumstances that you get visible zone lines. Normally you wouldn’t even see it. So no, there are no health concerns that are specific to spalted wood.